There's no doubt that after this weekend, Chris Pratt is going to be a household name as he leads the ragtag team of space thugs in Guardians of the Galaxy. And Universal Pictures and director Colin Trevorrow know that since a new photo from Jurassic World featuring only the "Parks & Recreation" star has just arrived. 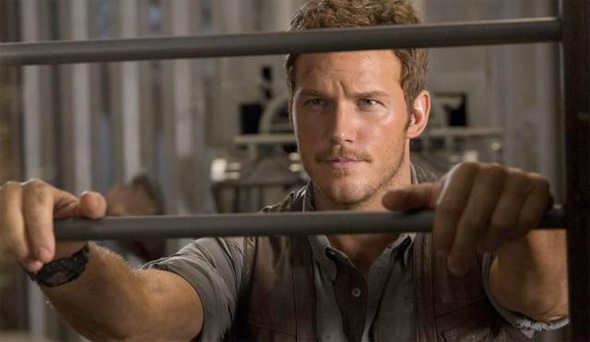 Again, there's still no dinosaurs, but it shows Pratt looking like a handsome leading man, peering through the bars of what is likely the cage to an unseen dinosaur. He certainly has the hero look down, and in this photo, he seems like a viable Indiana Jones replacement if he got the chance. Look! He got in shape for Moneyball and Zero Dark Thirty and then back out of shape for Andy during that time, too. I still prefer Chubby Andy from Parks and Rec. I do not like him in the "trim" form. I do however love this guy he is so funny I am glad to see his career taking off. I agree with you as him being a viable Indiana Jones. I love when you can actually picture new actors possibly play old favorites. I always thought Ryan Reynolds could actually play a decent younger Chevy Chase. Fletch? Maybe Im just stuck in the 80's. Somebody, some time ago hinted Bradley Cooper as Indy replacement, but Chris Pratt would be SO PERFECT for the role, Bradley Cooper lacks Harrison Ford's goofiness and comedic timing, Pratt is able to recreate that. Wheres a trailer for this .... WTF ?